Editor’s Note: This article is a part of the series Understanding Natural Phenomena. In this series of posts I am trying to take science to more people by explaining some key ideas in a simple language. Hopefully, it would lead to a more widespread understanding of what science has to say about the origin of our universe, and about the origin of life on Earth. I shall take up the ‘consciousness’ issue much later. There are quite a few formulations of quantum mechanics. The one used by Hawking &Mlodinow (H&M) in their book for explaining the existence of our universe is Feynman’s ‘sum-over-histories’ formulation. Richard Feynman was an intellectual giant, and one of the greatest physicists ever. I mentioned the Davisson & Germer experiment about electron diffraction in Part 3. Feynman was intrigued by some further variations carried out on that experiment. Suppose you close one slit and carry out the experiment. You record a pattern reminiscent of the single-slit experiment carried out earlier by Young for a beam of light: There is a diffraction pattern comprising of a central maximum and a number of secondary maxima. Now close this slit and open the other one, and repeat the experiment. You again get a similar diffraction pattern, a little displaced from the first one. But if you superimpose these two patterns, what you get is not the same as when the two slits are open at the same time. This is a most remarkable experimental result, which nobody can dispute. Even if you reduce the intensity of the electron beam so much that the electrons come one at a time, you still get the same result. This is intriguing. How does a single electron ‘know’ which slit is open, or whether one or two slits are open? During the 1940s, Feynman had formulated a new version of quantum mechanics, in which when an elementary particle goes from point A to point B, it has available to it all possible trajectories (or ‘histories’), and not just the shortest-path trajectory. This approach was in line with the Heisenberg uncertainty principle. According to this principle, there is an essential uncertainty in the exact location of the electron, which means that the electron can be everywhere in the universe at the same time, and not necessarily on any particular trajectory. Of course, there is a stronger probability that it would be in the vicinity of the slits in the above experiment, but the probability cloud characterizing its position extends over all space. 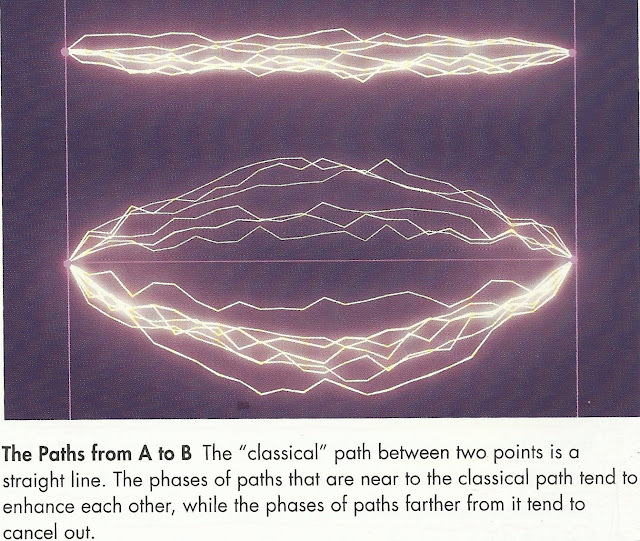 So the electron in the above experiment actually samples all paths (simultaneously), including the one in which it finds that one of the slits is closed. There is one probability distribution at one instant of time, and a slightly different one at the next instant, and so on. All possible histories or trajectories are equally real, each with its own probability value. Moreover, since the electron cloud extends over all space, all the alternative histories get enacted simultaneously. Feynman developed the necessary mathematics, including his famous ‘path integrals’, for summing over all possible trajectories, or multiple histories (each with an amplitude term and a phase term), for calculating the net effect. As can be seen from the corresponding ‘Argand diagrams’, trajectories which deviate too much from the straight trajectory contribute less to the overall sum (or integral), but they do contribute. 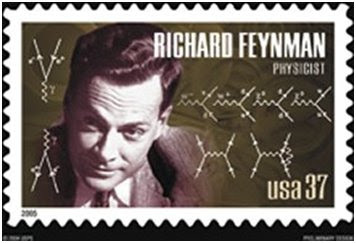 Feynman’s formulation was able to reproduce all the laws of quantum physics. It may appear as if nothing much has been gained, because we can obtain the same results by treating the electrons as waves and solving the differential equation (namely the famous Schrodinger equation) for the ‘wave function’ describing the electrons. But there was a conceptual breakthrough here: We must carry out this sum over alternative or multiple histories for any quantum system, even for the birth and evolution of the universe, and not just for electrons. This is what H&M’s model of the universe does. In Newtonian theory (or classical mechanics), the evolution from the past to the present is visualized as a definite succession of events, and there is only one history or trajectory. Not so in quantum theory. No matter how thoroughly and carefully we observe the present, the unobserved past, as also the future, is indeterminate, and exists only as a spectrum of possibilities. This means that our universe does not have just a single past or history. We know the present, but the present could have evolved from any of a fairly large number of possible histories, with various probabilities. Therefore we must sum over all those histories which can lead to the present we are in. A terrific fallout of this line of reasoning is that ours is only one of many possible universes. So there are multiple universes, and ours is just one of them. It is a different matter whether we can ever interact with the other universes. More on this later. Understanding Natural Phenomena 5: Can You Unscramble an Egg? Understanding Natural Phenomena 6: How can Order Emerge out of Disorder Spontaneously? Is this an endeavor to mislead people by providing false, imaginary explanations for phenomena for which science has no answers. Please admit that the materialist, deterministic brand of “science” has met its nemesis in quantum phenomena where the requirement of a conscious observer for wave function collapse cannot be denied – and hence the attempt to advance fantastic explanations such as multiple universes. Where is your proof for multiple universes and how is it different from pink unicorns. Please read Manjit singh’s book on quantum phenomena, where he, a self confessed leftie and materialist, is driven to despair by the irrefutability of the non intuitive aspects such as subject dependent observations, non local communications etc and its devastating implications for the mechanistic model of science. It is a century now and the Copenhagen interpretation has not yet been overridden. Feynmann himself admits as much when he says that the dictum in Quantum Physics is – shut up and calculate. Please read some recent papers on quantum mechanics, EPR paradox and role of consciousness. Regarding multiverse theory most modern physicists consider it more plausible than the consciousness based theory.Probabaly you have also not understood the implications of a consciousness based theory. I would like to know what recent papers you have read on this subject, something which is essential in keeping a person’s knowledge updated.